Pt. 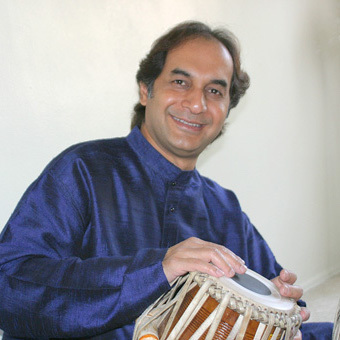 Arup Chattopadhyay is recognized as one of the most outstanding and sought after Tabla artists of this generation. He has established himself as a top-notch accompanist as well as a formidable soloist. Arup's performances are admired for their exceptional tonal quality, clarity and deep compositional repertoire, all presented with an innate sense of rhythm and melody. Arup began learning Tabla at age six from his father, the eminent Tabla player, Pt. Pankaj Chattopadhyay. He then came under the tutelage of the world-renowned Tabla maestro Pt. Shankar Ghosh and is one of his premier disciples. He was awarded Top-Grade by All India Radio and Television. Arup has accompanied many of the leading musicians of India such as Pt. Ravi Shankar, Ustad Rais Khan, Ustad Aashish Khan, Ustad Shahid Parvez, Pt. Vishwa Mohan Bhatt, Pt. Nayan Ghosh, Pt. Ajay Chakarbarti, Lakhsmi Shankar, Pt. Rajan and Sajan Mishra, Ustad Rashid Khan, the late V.G. Jog, Pt. Tarun Bhattacharya, Pt. Tejendra Narayan Majumdar, Pt. Kushal Das, among others. Since 1998, Arup has been honored to accompany the legend Bharat Ratna Pt. Ravi Shankar in tours throughout the US, Canada, Europe, and India, Including performances in Carnegie Hall, Kennedy Center, Lincoln Center, in US, and Barbican hall in London. Arup toured the U.K. with the late Pt. Deepak Choudhury several times and with Pt. Kartik Seshadri (since 1997) throughout the USA, Canada, India, Mexico and Australia. Arup is also a highly sought after teacher and since 1999 has been a visiting lecturer with University of California, San Diego; and previously a professor of Tabla at Baratiya Vidya Bhavan in London (Institute of Indian Culture).